As you can see from the picture (above), the sterling silver is very bright and pretty. Dainty, too–the chain and beads are pretty small! I like how the beads break up the dangling chains, giving it dimension and style. All the chain, links, and beads feel pretty secure. No visible ‘weak-links that I could detect. All in all, these earrings were very well made! They are the kind of jewelry that will last. I love ’em! Thanks Jen for designing and making quality jewelry!! And my little fringe earrings isn’t the only thing that Arbotique Designs offers. Just check out this necklace (left) that I found today. Too pretty!! I LOVE the light blue with the sterling silver. Very pretty!! As I said, there are lots of other pieces of jewelry available — earrings, necklace, bracelet, rings…she even has a “destash supply” folder filled with pretty cool-lookin’ rock pendants. Okay, before we get on to the giveaway…if you are (like me) unable to wait to see if you win the giveaway. Or if you found something else on Arbotique Designs that you just LOVE. Be aware that Jen has offered a 20% discount for all my readers for the month of September. Yep! That’s right! Get 20% off your order from Arbotique Designs by using the code “legacy20” at checkout and–BAM!–it’s cheaper. But make sure you use this discount soon–it only lasts until the end of September!! So! Now that you’ve read about Arbotique Designs and seen my thoughts on the jewelry…it’s giveaway time!! Jen has very kindly offered her Sterling Silver Morse Code Necklace (customized with up to 6 words) to one winner! Follow the instructions in the rafflecopter below to enter! The giveaway ends 9/17 at midnight. 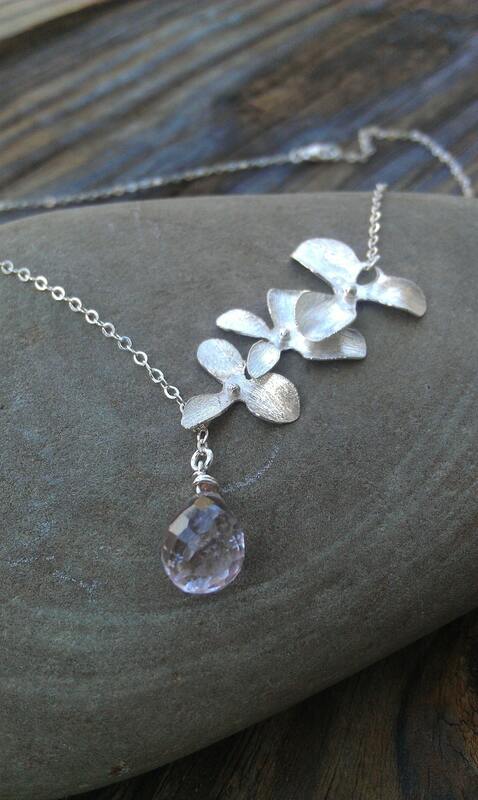 I think my favorite is the Sterling Silver Orchid Flower Lariat Necklace with Mystic Quartz. It is so unique yet so beautiful. The large Sterling Silver Birds Nest is one of the loveliest pieces of jewelry I have ever seen. What a great giveaway! My very favorite was the Branch Necklace- Sterling Silver Branch/Vine Necklace withLondon Blue Topaz Drop. Just gorgeous, but there was so much to choose from! Everything is so gorgeous, but this is absolutely stunning and my favourite piece! I'm all about some pearls, so I really love the layered pearl necklace. But! I also love birds and this necklace kind of combines the two…. Oh goodness, I love so much of it! But I'm *drooling* over the long sterling silver multi gemstone necklace!